Home / Moving Tips / Moving Statistics / Where Are People Moving Within Chicagoland? Where Are People Moving Within Chicagoland? It is well documented that residents of the Chicago metro area are moving to other states. Whether it’s the economy, weather, or better job opportunities, Illinois residents continue to flock to states such as Texas, Florida, and California. It seems a new article appears every day discussing why Illinoisans are leaving the state. However, where people are moving within the Chicago metro area garners less discussion. While the 20th century saw massive movement to the suburbs, it is a commonly held belief that this movement has slowed down. Particularly among millennials, moving to urban centers from suburbs appears to be increasingly popular. The question is, to what extent is this supposed trend backed up by data? As a moving comparison engine that began operation in the Chicago area, Move Matcher has helped facilitate thousands of moves within Chicagoland over the past year. Each day, customers use our site to request quotes from multiple moving companies that operate in the Chicago area. Using the move details provided to us by customers since the beginning of 2017, we have compiled data detailing where people are moving to and from in Chicagoland. For the purpose of this study, we have excluded moves outside of the state of Illinois. Due to the high amount of movement between apartments, it is no surprise that the majority of moves in the Chicago area stay within the city limits. Among Move Matcher users that entered their moving destination as Chicago, 74% were moving from another address within the city. While it would be easy to guess that the majority of moves take place within Chicago, the question remains, are more people moving to or from the suburbs? According to our user data, 13.4% of moves originating in Chicago are to a suburb. Remember, this data is only incorporating moves that stay within the metro area and the state of Illinois. Comparatively, only 12.6% of moves ending in Chicago are coming from the suburbs. This data illustrates that a higher percentage of people are moving from the city to the suburbs than vice versa. While the difference is not substantial, it is still more common for city residents to move out, than suburbanites to move into Chicago. Although it is clear Chicago residents are still heading to the suburbs, many are staying within Cook County. Among Move Matcher users, the most popular suburban cities to move to were Evanston and Oak Park, both located on the border of Chicago within Cook County. Behind the two border cities, Naperville was the third most popular suburban destination for movers from Chicago. Skokie and Berwyn rounded out the top five, meaning four of the five most popular destinations were within Cook County. 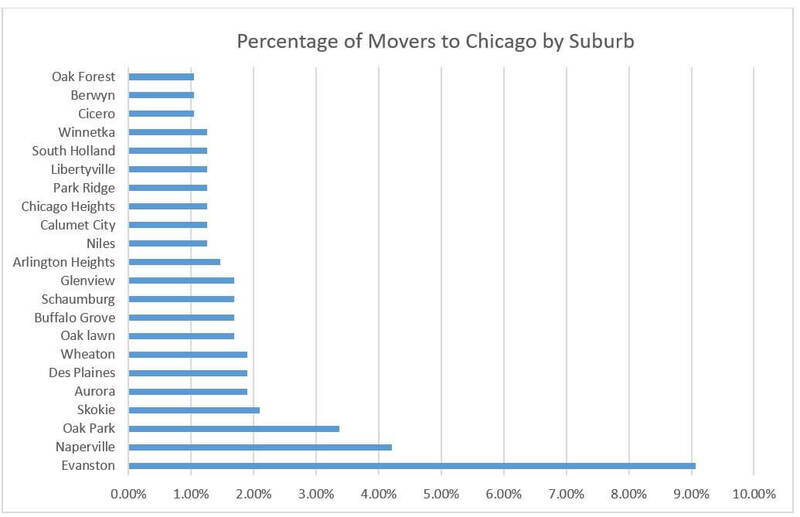 Here is a graph listing the most popular suburbs to move to from Chicago. The percentage is calculated based on the number of moves from Chicago to that city divided by the total number of moves from Chicago to all suburbs. 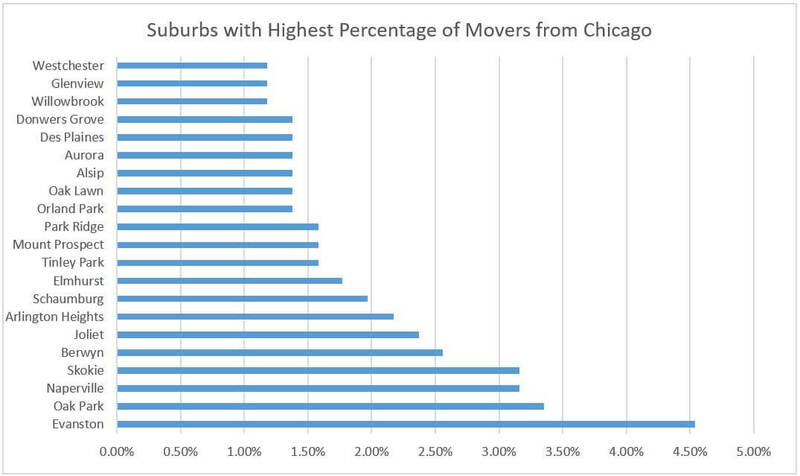 After Naperville, no other suburban city received more than 3% of movers from Chicago. Based on the cities listed, it appears that most Move Matcher users prefer to stay relatively close to the city. The most popular suburbs are either in Cook County itself or in the collar counties of DuPage, Will, and Kane. From an economic standpoint, it appears that higher taxes in Cook County are not the main motivating factor for individuals moving to the suburbs. Clearly, nearby suburbs are the most common destination for moves from Chicago. With that information, we also wanted to investigate which suburbs had the most moves to Chicago. Would the same trend hold true of moves coming from a shorter distance? Or, would suburbanites be more likely to move downtown from suburbs further away? The percentage displayed next to each city in this graph is calculated by dividing the number of moves from an individual suburb to Chicago, by the total number of moves from all suburbs to Chicago. Similarly to the percentage of moves from Chicago, Evanston is at the top of the list in percentage of moves to Chicago. With its proximity to the city, it’s not surprising that Evanston has the highest percentage of suburban moves to Chicago. However, where this list differs is that population is a much bigger factor. Aurora is ranked 5th in percentage of movers to Chicago, whereas it ranks 16th in moves from Chicago. Wheaton is another city that had many more moves to Chicago than from the Windy City. The west suburban town ranked 7th in moves to Chicago. In contrast, Wheaton was not in the top 20 in moves from Chicago. Most Illinois residents already know that many of their neighbors are fleeing the state. However, there has been less talk about where people are moving within Chicagoland. Popular culture has suggested that less city residents are moving to the suburbs. However, according to Move Matcher data from 2017, a higher percentage of Chicago residents moved to the suburbs than vice versa. Although some would blame the higher taxes of Cook County, that may not be the case. In fact, four of the five most popular suburbs to move to remain in Cook County. Evanston, the city directly north of Chicago, maintains a flow of residents both into and out of the city. Nearly 5% of moves from Chicago to the suburbs were to Evanston. Over 9% of all suburban moves to Chicago came from Evanston. Directly west of the city, Oak Park is also a popular destination for Chicago residents. With its large population and numerous job opportunities, Naperville remains popular despite being further from downtown. The key finding from this study is that Chicago residents who move to the suburbs generally prefer to stay as close to the city as possible. Living in cities such as Evanston, Oak Park, Berwyn, and Skokie allow residents to stay conveniently close to Chicago. As the cost of living continues to rise in Cook County, it will be interesting to see if cities in Dupage, Kane, Kendall, Lake, and Will counties see a surge in population. However, for the time being, it appears most suburban movers enjoy staying within the shadow of the City of Broad Shoulders.